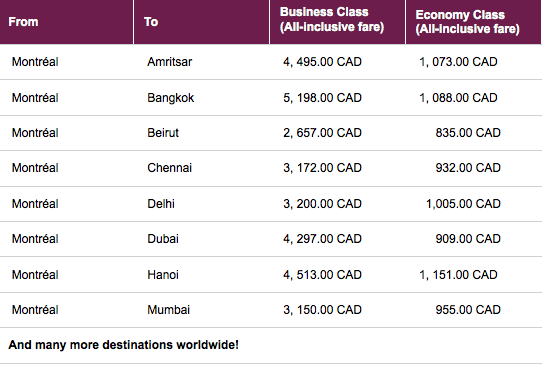 Qatar Airways has launched a new seat sale on flights out of Montreal to over 140 destinations Worldwide. Fares start at $835 all in for Economy Class and $2,657 for Business Class to Beirut. Fares to India and SE Asia are also attractive! Tickets must be booked by April 19th for travel until December 10 (Economy class has August 1 - September 5 blackout period). Find more fares and book this offer here. Remember that if you connect to a flight out of Doha that is part of their current Globetrotter promotion you can earn thousands if not tens of thousands of bonus miles on those connecting flights For more on the bonus miles offer see here. Sample fares for this current seat sale!